Good Old Spinach: Now a Superfood! 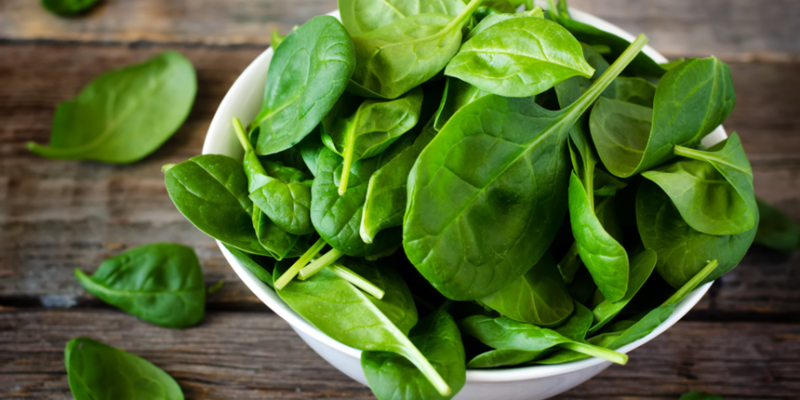 The wondrous health benefits of spinach have been known for centuries. 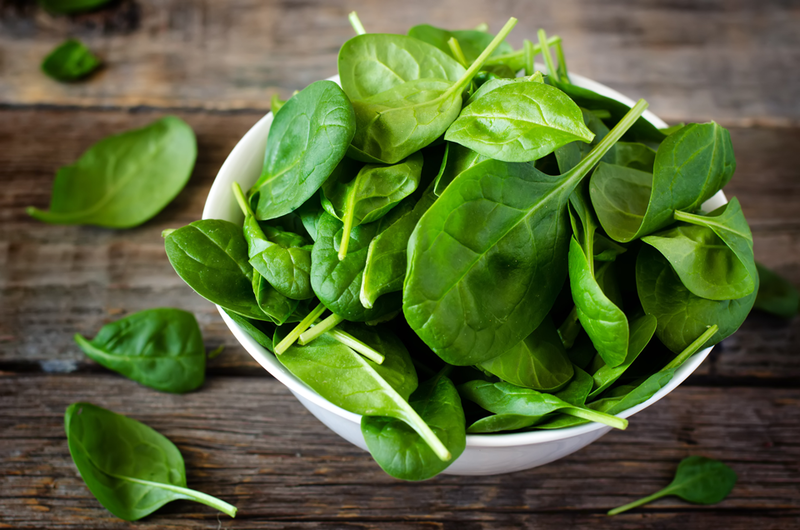 Now we know that spinach is actually one of the healthiest vegetables you can eat. Just the dark green colour and pearly shine of the leaves tells us they are bursting with vitamins, minerals, and tons of goodness. Spinach is known to be of Persian origin, but it quickly spread to and across Europe in the 12th century. This well-known muscle-builder is a food that should be eaten on a daily basis because of its profound health benefits. Spinach benefits all parts of the body and is well known for enhancing memory and brain-function, however as you’ll soon read there is a caution you must be aware of . . .
1. Fat- Spinach contains 0% saturated fat. This means it also has great weight loss benefits, as one serving has just 7 calories, making it ideal for any weight loss program. However, it is rich in Omega 3 fatty acids, which are essential for a healthy heart, brain, and can also prevent cancer. 2. Carbohydrates- Another desirable quality of spinach in today’s world of low-carb diets is that it contains no carbohydrate at all. People are often surprised to hear that many vegetables contain carbohydrates. Not so in the case of spinach, making it perfect for those low-carb days. Having said that, a small amount of carbohydrate is essential daily, as it gives the cells of the body the energy they need to function. 4. Cholesterol- Again, 0%, meaning spinach will not be clogging up any arteries and will keep your heart healthy. 5. Fibre- Spinach is a good source of dietary fibre, containing 3%, making it good for digestion and intestinal health. 6. 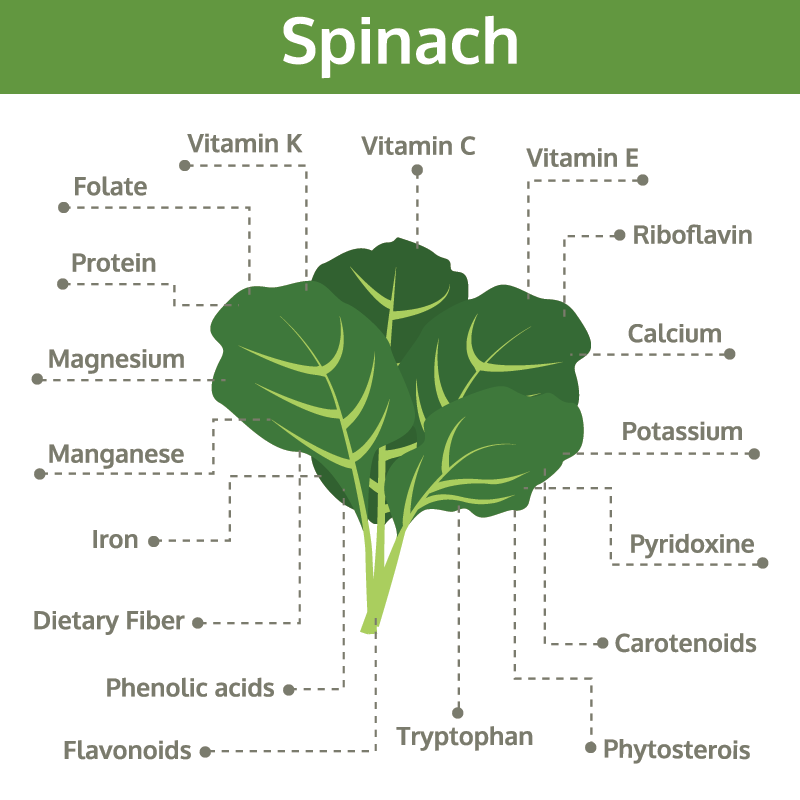 Protein- Spinach is 30% protein, so it can be an important part of any vegetarian or vegan diet. Protein is essential for growth and repair of the body. 1) Juice- Spinach can be eaten raw or cooked, and since it contains a large quantity of water it can also be made into juice. The benefits of spinach juice are that you need a whole lot more spinach to make a juice than you would normally eat, meaning you are packing in the nutrients with just one glass. Add goat’s cheese or feta cheese, some pommegranite or dried figs to baby spinach, drizzle with olive oil or coconut oil and balsamic vinegar for a delicious, easy spinach salad. Alternatively, add wild Atlantic salmon, ripe avocado, pine-kernels and your favourite dressing for another easy spinach salad. 3) Cooked- Cooked spinach has been shown to contain the same amount of nutrients per 100g serving (7). Spinach can be added to stews and omelettes and even to pulses such as chick-peas. The delicate flavour of spinach means it can be eaten in any number of ways, turning any dish into an interesting, healthy, nutrient-rich meal. For those who aren’t members of the clinic and you would like to find out more, there are 3 ways you can get in contact with us . . .
1. I have other health challenges, I’m still uncertain if you can help me and I would like more information about your complete Wellness Program! . . .
2. I would like to book for your Free 20 minute consultation online to ask further questions on how you can help me . . . or I will phone you on 07 5440 5678. 3. I’m pro-active about my health, I want to book now and I realize the consultation is normally valued at $300.00 and if I act NOW I will receive the consultation for ONLY $147. Disclaimer: The information provided does not take into account individual needs of any particular person. When providing this information it is intended as a sharing of knowledge and information from the research. The information provided should not be construed as personal medical advice or instruction and is not intended to replace a one-on-one relationship with a qualified health care professional and is not intended as medical advice. We encourage you to make your own health care decisions based on your research and in partnership with a qualified healthcare professional. (6)Grazyna Jaworska G, Kmiecik W. Content of Selected Mineral Compounds, Nitrates III and V, and Oxalates in Spinach (Spinacia Oleracea L.) and New Zealand Spinach (Tetragnoia Expansia Murr.) .